D I D W E D E S I G N T H E L O G O ? 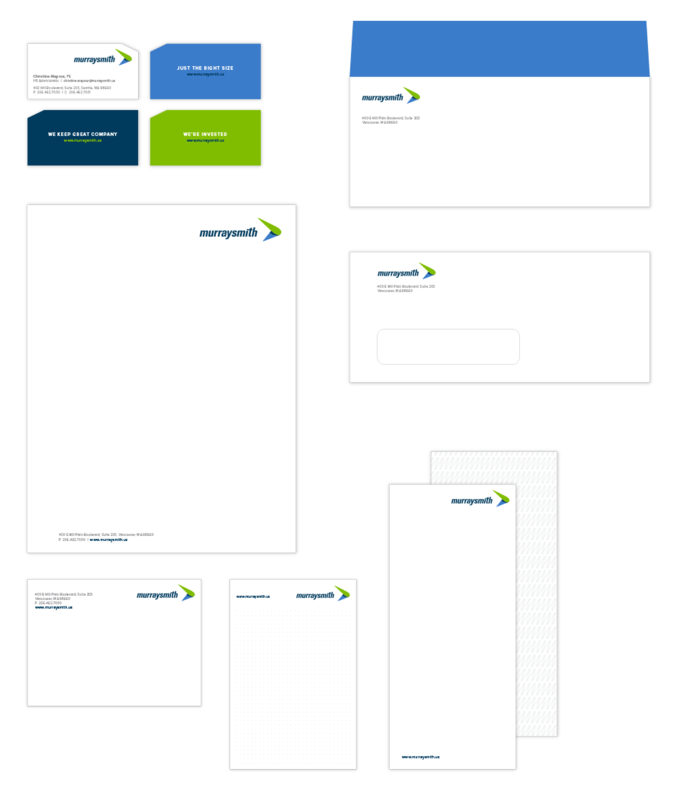 While MSA marketing team members understood the value of branding, several owners were reluctant to invest in a rebrand. Business was strong and memories of a failed attempt at DIY rebranding and a false start with a consultant unfamiliar with A/E/C marketing lingered. To help MSA make an informed decision, David proposed the firm commit only to the Discovery Phase, including a review of its strategic plan, a brand audit rating 75 brand touchpoints, personal interviews with recent hires and a competitive audit. 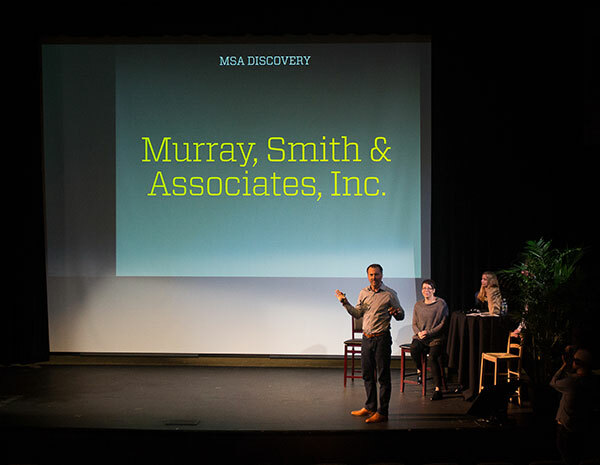 The Discovery Phase uncovered the use of two brand names: MSA and Murray, Smith & Associates, Inc., contributing to confusion in the marketplace and a lack of focus. 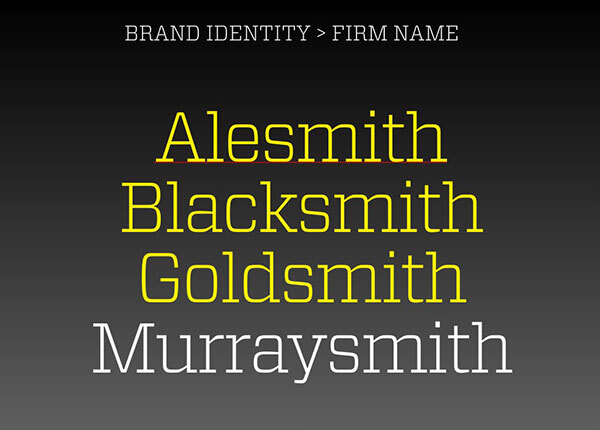 Internal and external interviews revealed a brand identity that had gone stale. Inconsistent versions of the logo compounded the problem. 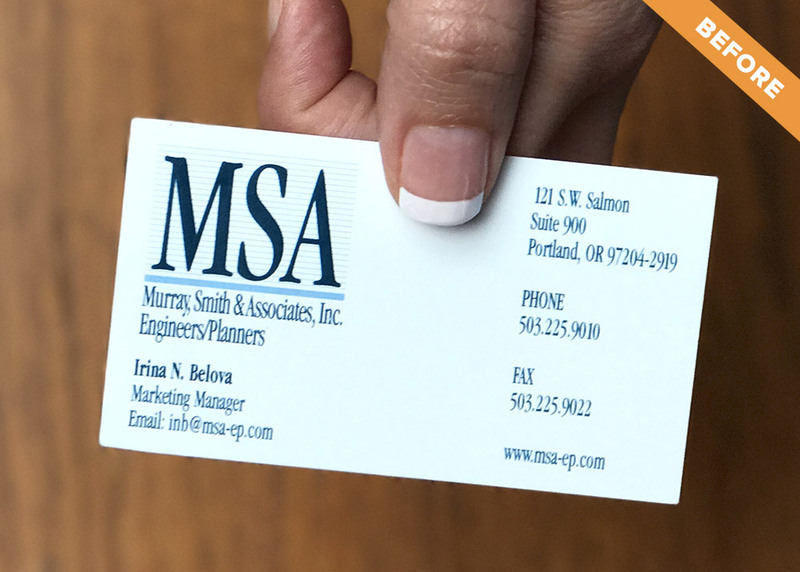 Based on the Findings & Recommendations Report we prepared, MSA employee owners agreed to move forward with a rebrand. 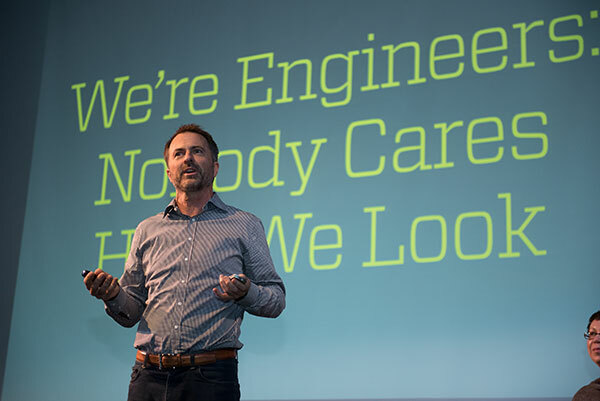 The firm’s primary rationale for rebranding was to attract and retain talent, though the work would also benefit marketing and business development. 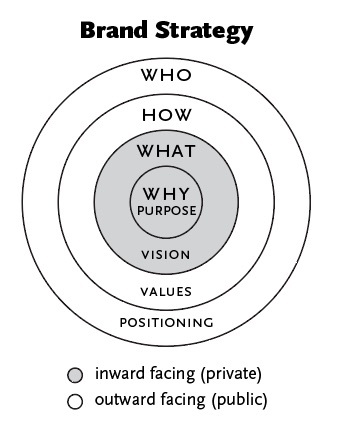 A strong brand is rooted in brand strategy, which means having well-articulated Purpose, Vision, Core Values and Positioning statements. 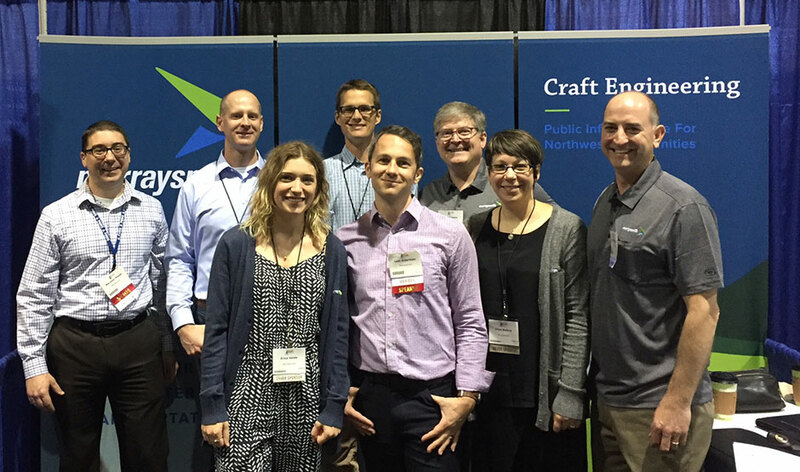 Just the Right Size – We are large enough to employ diverse talent to solve your biggest challenges, yet small enough to genuinely care. We Keep Great Company – We take care of our people so they can take care of you. 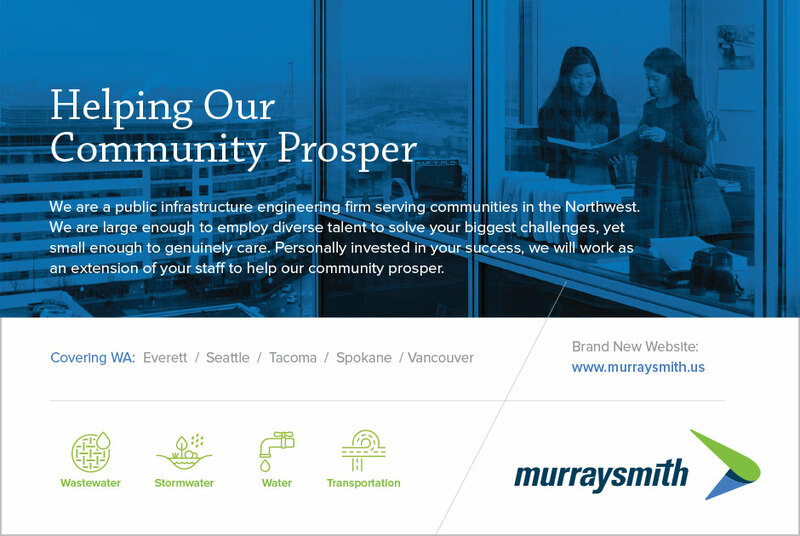 We’re Invested – We live where we work­—so we take project success personally. 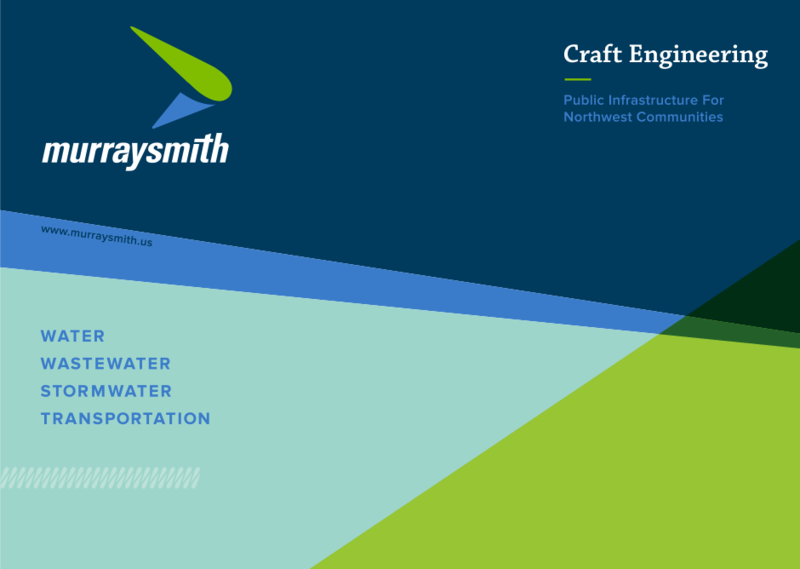 From those three unique differentiators, we developed a positioning statement that defines the firm type (engineering), who it serves (communities) and how it is unique (public infrastructure and we live where we work). 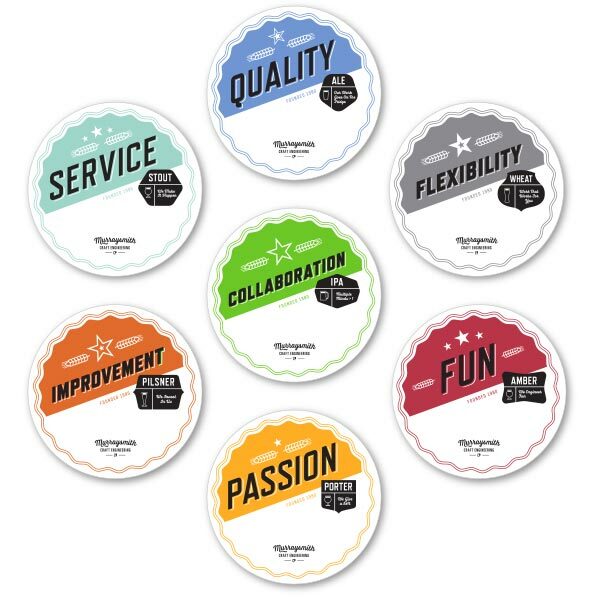 Our workshop also yielded seven core values, which we later expressed on craft beer coasters to reinforce the themes of “just the right size,” exceptional quality and focus on the Northwest. 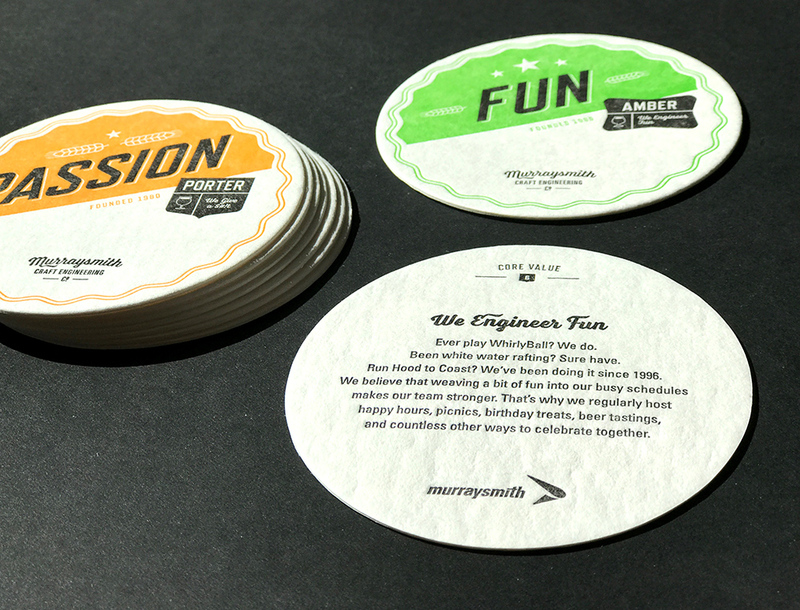 Each coaster is letterpress printed (a craft printing technique) with the value on the front, and more detail about its meaning on the back. Before developing the new firm name and logo, we established five brand personality attributes to guide all future marketing communication materials and activities. We presented the first round of logo exploration in grayscale to focus on the raw form and avoid any color bias. We refined three finalists in color and also developed a mock business card and custom pattern exploration. All employees receive business cards with three different backs to honor the three unique brand attributes. 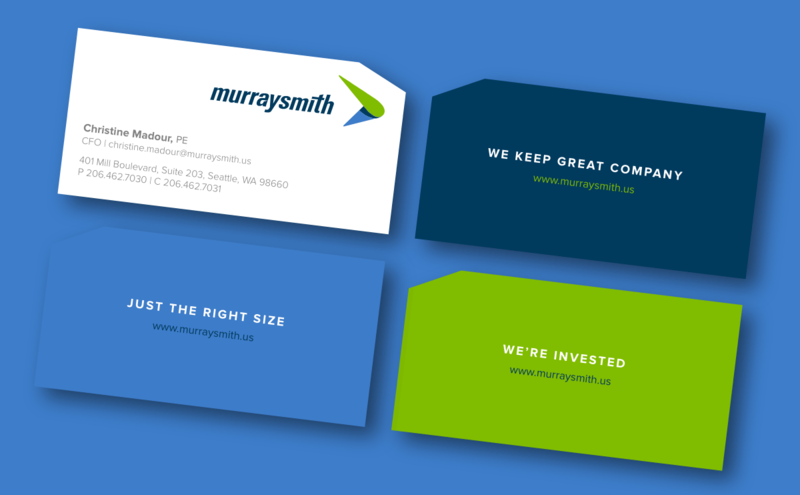 The cards are efficiently smaller than conventional size because Murraysmith isn’t a conventional firm. 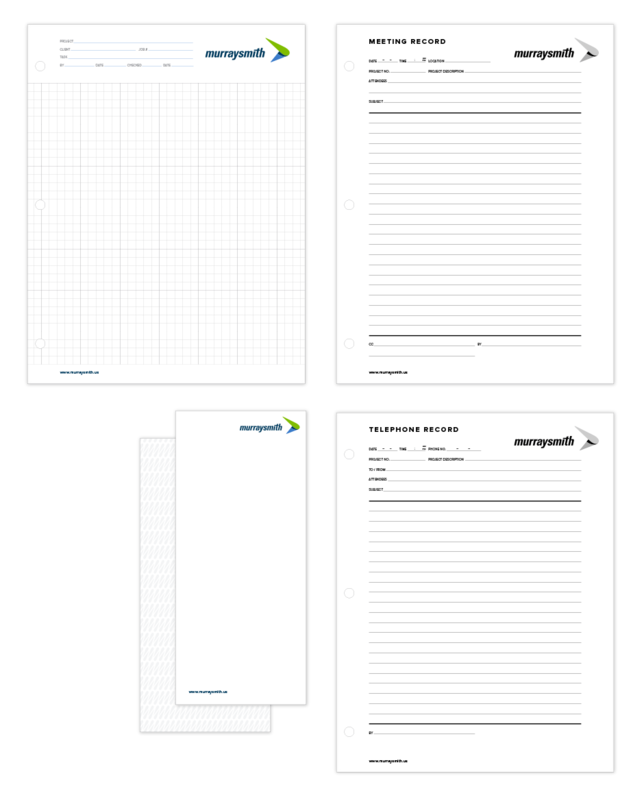 When an employee hands a card to a prospect, the recipient might remark, “that’s an interesting size.” The employee can then proudly reply, “actually, it’s just the right size” while handing out the version with “Just The Right Size” on the back. An often overlooked, but critical component of a successful rebrand is building support within the firm before the external launch. Having an entire firm of brand ambassadors to evangelize the firm’s message is considerably more effective than an isolated marketing campaign. 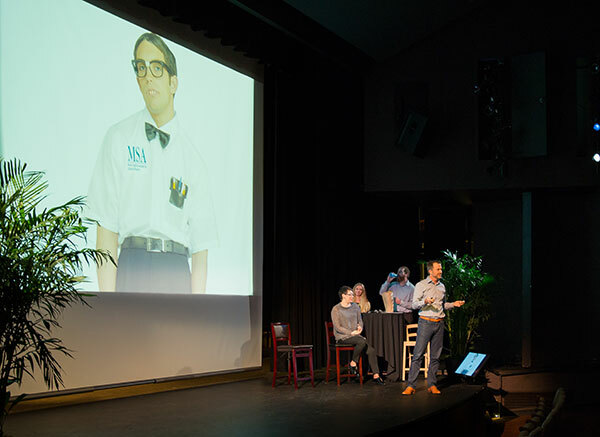 Two and a half months prior to the launch date, employees from all eight offices participated in a half-day strategic plan update that included presentation of the brand strategy and an unveiling of the new logo and website preview. In the five days leading up to the launch, employees received a daily email message answering frequently asked questions and reengaging the entire firm as brand ambassadors. These emails were timed to coincide with the distribution of new business cards and other launch tools. 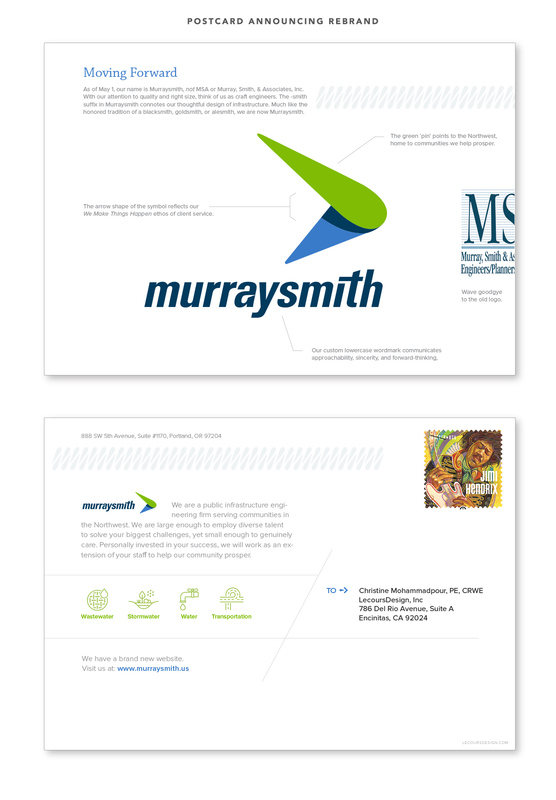 LecoursDesign/Murraysmith earned three national awards at the 2018 SMPS Marketing Communications Awards: best rebrand, best website and best recruiting/retention promotion.